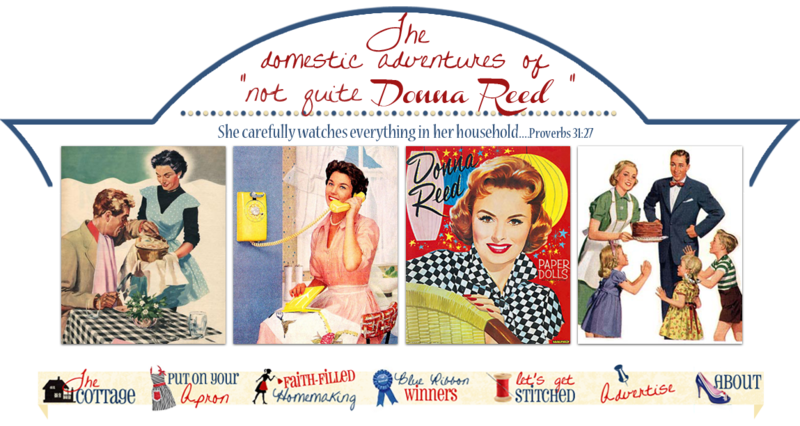 Not Quite Donna Reed: Join me for "LET'S GET STITCHED!" Join me for "LET'S GET STITCHED!" For the last two months I have had this little gem in the works. Basically, it is a link up to share all things stitching related. A way to showcase and share our handmades with each other. I just love seeing what others are making! Every Monday I will post my finished or works in progress (WIPS) with a linky tool at the end of the post. There are a few guidelines to follow and they are easy. Just post a link to your project right here at Not Quite Donna Reed and then link back on your blog to the Let's Get Stitched Page. You can use the code on the button in the sidebar and just edit your html when you compose a post or just let your readers know you posted here and provide a link. Your post can be anything sewn, knitted, crocheted, embroidered or the like....it just has to include some stitches. I do love to take moments on the weekend to include a bit of handwork. It is soothing and relaxing and spells weekend to me. Please share any little stitches you managed to accomplish. Here is a WIP, it is the Edith Twirl Skirt for my France obsessed daughter. This skirt is super big on the twirl factor. What little girl isn't? Not a skirt for the beginner sewer, but really easy once you get a few techniques under your belt. Visit Heather Bailey for some fantastic shots of this skirt! I also have the material shown in the pic so I can make another one right away--I am told..ahem. You can also order the pattern in a PDF download right HERE. Really cute twirly skirt. Adorable!